Time flies.... 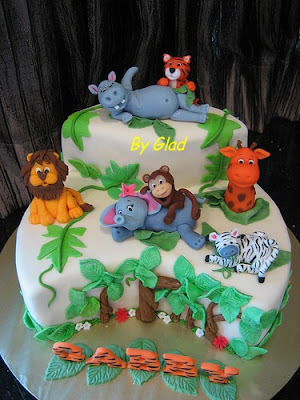 I still remember last year before I did Gabby's cake, she was not well then... this year Gabby's mom, "K", approached me and requested for jungle animals theme. The cake is merely for family celebration as they love the moist chocolate cake (am so glad to hear that). Same as last year, she leaves everything to me from design to colour, all she does was telling me she needed size 9" round cake and jungle theme.... So I made this 9" single tier with a little two tier effect and the monkey was not requested but I added that in..... to thank Gabby's mom for her trust on me :) Thank you "K", nice chatting with you and your hubby. Besides I'm also very happy to note that they still keeping last year's figurines and Gabby loves to see those figurines. Happy 3rd Birthday to you Gabby! where did you get your alphabet cookie cutters? they are fabulous, i want some! the font is so cute, and each letter is consistent. i love your cakes! u are a very generous creation.. who is willing to share ur talent with others..